First of all, of course, is the cost – why pay to store something that you can stick in your loft or garage. The simple answer is that many people don’t have spare space on their lost or garage, even if they have one. New homes are getting smaller all the time and it’s hard to find space for the day-to-day items we need around us for everyday living let alone inherited heirlooms, camping equipment that we only use every couple of years and garden furniture that only comes out for 2 or 3 months of the year. So there are plenty of reasons we need self-storage and fortunately, there are some really good deals out there if you know where to look and don’t get sucked in by a bargain headline rate. So, first and foremost, do your research and make sure you work out the cost over the likely period of time you will be using the storage, especially if you think it is going to be a long term arrangement. Headline discounts are usually only for 4-8 weeks but the average time someone rents a self storage unit for is much longer. You know, you start off thinking you will just put you stuff in storage for a month or two while you have some building work going on – then the building work takes twice as long as expected and even when it’s finished it takes a while to get the house back to normal and even then you have got used to the clutter-free environment and all that extra space and before you know it a year has passed – or is that just me? So watch out for discounts that cost more in the long run as the chances are you will be storing for longer than you planned. When you are looking for a self storage facility at the right price don’t forget to look outside your immediate area, especially if you live in an expensive town or city centre location. If houses are expensive compared to the national average where you live then you can bet that business have to pay more for their premises too, which means they will charge you more to store in their facility. Nationwide self storage companies will charge different rates in different locations so even if you have decided which company to use the location closest to you may not be the cheapest and it might be worth going slightly further afield to save on the rental costs. Also check out collection and delivery services if they are offered – this could save you the cost of hiring a van and the time taken to cart your stuff to the storage unit. Facilities that aren’t in town centre locations do sometimes provide free collection services if you rent a unit for a minimum period so they can work out cheaper as long as the minimum period fits in with your plans. So that’s cost and location but what about the actual unit type and size? What type of storage unit you require really depends on what you will be storing – if you have a designer sofa upholstered in expensive leather or designer silk fabric amongst your possessions then clearly an old shipping container in a yard with little security won’t be your first choice. Neither would that type of unit be suitable if you store fragile business goods such as clothing, antiques, canvas paintings. On the other hand if you need to store seasonal goods such as garden furniture, camping equipment, Christmas decorations etc, whether as an individual or if they are your business stock, then a shipping container in a yard may be perfectly fine. Do, however, make sure the security is appropriate for your needs especially if you have a significant amount of new, valuable stock for your business. It will keep well if stored in a container without deteriorating over time but security is always important when it comes to storing belongings so ditto digital recommend checking out a particular facility’s security before making a decision: check about CCTV cameras, fencing, alarms, controlled access, barriers, security guards. And also what type of padlock can be used on the container and the physical strength of the container door too. The best security padlock won’t keep a thief out if the door itself has flimsy hinges that can be easily broken off. If you already know that you want a storage unit inside a warehouse then there are still other factors to consider – a key one being ease of access to your particular unit once inside the facility. Is there a lift, for example, or will you have to lug your stuff up the stairs? If there is a lift, how far away from it is your potential unit? Some facilities don’t even have stairs and their storage units are stacked on top of each other – only accessible by step ladders (yes really!). Obviously there is a cost benefit to opting for one of these and it may suit you if, for instance, you are moving abroad for a couple of years so won’t be in a position to pop down to the storage facility to retrieve something from your unit – it’s horses for courses really, but just be aware of all these factors. When looking at different storage units sizes many are quoted in square feet or metres but, clearly, the height of the unit is also useable space. The difference between a 35 square floor unit that is 7 foot high and a 5 foot high unit is considerable in storage area – not to mention the fact that most of us couldn’t even stand up in a 5 foot high unit – but they do exist so double check the height before signing on the dotted line as some units are little more than boxes. Most good self storage facilities will offer advice on how much can be stored in their units so take their advice, they are much more experienced in calculating the space needed than you are and can offer packing advice to make the most of the space you are renting. But then again if the only storage units available are way too big for you then don’t pay for unused space. Look elsewhere – there are plenty of options to choose from. Humidity can be a problem in storage units in the long term for items such as fabric, wood and other delicate materials according to problogineer.com, especially units stored outside that are subject to large temperature variations and humidity changes. But climate controlled units are significantly more expensive so do you really need one? Well, the decision is all about how much you value the items you are storing and what your budget is for storage and then balancing those two factors out. For instance, wooden furniture could benefit from climate controlled storage that will maintain a constant temperature and humidity whatever the weather is like outside but if the furniture is basic stuff, not worth very much, you may not consider a climate controlled unit necessary. On the other hand if you have some valuable antique pieces of wooden furniture that you inherited from grandma and you view as an investment for the future then you probably would be prepared to pay the extra cost for climate control. Take a look at some of the other things you might want to consider climate controlled storage for if you are based in an area with extremes of temperature. Of course, here in the UK, especially in the south we might not have perfect weather but neither do we have drastic extremes of temperature and humidity and before you go splashing out on the most expensive unit remember that some smaller units that are stored inside a warehouse are protected to a certain extent from temperature variations so always check with the staff at the particular location and take their advice. After all it’s in their best interests to make sure your possessions are well-protected while in their care. Too much moisture in the air can discolour leather and too much heat and not enough moisture can dry it out making it crack so leather furniture (or leather clothing for that matter) needs some special care. If you have a high end Italian leather designer sofa, of course you want to protect that but a run-of-the-mill leather armchair from a bargain high street chain you may be less concerned about. Whatever type of storage you opt for apply some leather cream to your items before placing in storage – this will add protection for all types of extremes of temperature and humidity. Washing machines, dishwashers, fridges, coffee machines, microwaves etc may need added protection from the elements if being stored long-term in certain regions with large weather variations across the seasons but for short term storage they would be fine in a regular unit. However, don’t forget to ensure all appliances are perfectly dry before storing then, especially dishwashers and washing machines, so they are not adding to the potentially damaging moisture build-up inside the unit. Wine needs a constant temperature as it is the large variations in temperature that will do it the most damage (so those of you storing your expensive wine under the stairs in a centrally heated house would be better off storing it in an unheated room – quick, move it now). The ideal temperature for wine storage is a constant somewhere between 12-14 °C. You might be a budding artist who wants to store their canvases somewhere safe and easy to access, you might be running an art gallery business with limited storage space or just be lucky enough to have accumulated an extensive art collection for posterity. Either way artworks whether on paper or canvas, framed or unframed need special care while in storage. They should be wrapped in acid-free tissue paper and carefully stacked – slatted wooden shelving is a good option for this – framed and glazed artworks can be stacked horizontally on top of each other with good padding in between but canvases are better off staked vertically with padded protective corners. Remember many canvas works will have a wooden stretcher frame which also needs to be protected from warping so make sure they are stacked carefully. If you are keeping business documents in an archive then they must be important documents that you are obliged to keep for regulatory reasons. So if you might one day have to produce those documents for a legal case, a tax investigation or any other reason you want the documents to be in good condition. If they are not adequately protected they can fade or discolour with time and become illegible negating the whole purpose of keeping the document archive in the first place. If your business documents include printed photographs then you will definitely need to keep them protected in a climate controlled storage unit. Again short term storage in a moderate climate should not pose too much of a risk to electronic equipment, but if you are storing expensive electronics long term, especially if they are your business stock, and if you are based in a region of large temperature variations throughout the year then definitely consider climate control. If you don’t then there is a real risk that the moisture naturally present in the air will build up on sensitive electronic components and wiring and eventually cause irreparable damage to the piece of equipment. So we’ve considered cost, location and the type of storage unit you might want but it is always interesting to know what people are storing in their units. Some of the popular storage auction TV programmes have revealed gold coins, unpublished music by famous artists, dead snakes and other animals and even a dead body but most of us are going to be storing something far more ordinary, but nonetheless precious to us. So let’s take a look at what are typical uses of a self storage unit. The ease with which an entrepreneur can set up a small online business with a slick website and efficient e-commerce services has simply boomed in the last decade. There may still be pockets of the country with poor broadband connections but for most of us we are benefitting from super fast broadband (well, OK, fast broadband anyway). This has made it easy to sell from an independent website or through the likes of Ebay or Amazon; and many people are making a good living doing just that. For many of those businesses they originally started working from home maybe storing stuff in their garage but for those entrepreneurs who have made a success of that business model they soon started to outgrow their available garage space. Typically they wouldn’t want a long term financial commitment leasing warehouse space (which in any case would be more expensive) and so they have turned to self-storage as the perfect solution to their storage needs. Inexpensive, no long term commitment, secure for their valuable stock and with easy access, sometimes 24/7 7 days a week to meet the needs of the online shopper. But it is no longer just the online sellers taking advantage of cheap self-storage rates, even bricks and mortar businesses can run short of storage space. After a long drawn out recession that is still fresh in the minds of many business owners there is also a reluctance from well-established businesses to make large financial commitments. That doesn’t look set to change any time soon as the UK embarks on the long process of leaving the EU and all the uncertainty that brings with it. So self storage has been somewhat of a knight in shining armour for small businesses. We may still vividly remember the recession with plummeting house prices in many parts of the country but people still need to move house. People get married, have children – the children grow up and need more space or a different environment, better schools or transport links. People still divorce and need two separate homes, they still get promoted and transferred to a different office beyond commuting distance of their present home and young adults still want a home of their own. So there may be ups and downs in the property market but there will always be people moving house. And where there are house movers there will always be the need for storage. All those people downsizing, whether through need as they get older and find a larger property difficult to manage or through choice. For instance, when a couple decide to go their separate ways and have to downsize as that is the only way to buy two homes from the value of a single family home. These people don’t necessarily want to get rid of all their stuff, although there can be a cathartic effect from a major declutter at the end of one phase of your life. So what do they do – they place in in self storage until such time as they are ready to declutter or their circumstances change. You only have to try and book a builder at short notice in the South East where I live to realise that they are all booked up for months to come (at least the good ones are – so great now that we have CheckaTrade). That’s because they are all busy adding extensions, doing loft conversions, knocking through walls, upgrading kitchens and bathrooms in the never ending bid to improve our homes. I’m not even going to mention the raft of TV programmes showing us how to do it in style. And when we are renovating, extending or improving we need to move either some or all of our belongings out of the house while the builders move in for the duration of the work. You may be fortunate enough to have a large garage but often the garage is involved in part of the building work. So there we have yet another reason why self storage has become so popular in recent years. It is simply so easy to transport your items to a local self storage facility – pack it into a secure unit and just leave it there until you need it again. The security is typically better than in most homes and certainly much better than kept in a damp garage. Better still, some self storage companies will arrange collection (sometimes even for free). My favourite is when they deliver an actual storage unit to your home (provided, of course you have the driveway space for it). 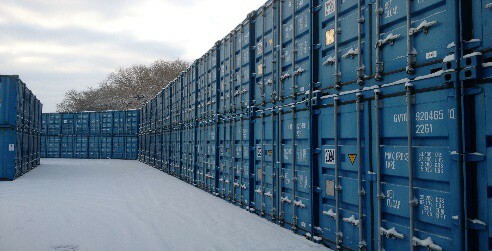 You can then load it up at your leisure and when it is full they will come and take it off to their storage warehouse. What could be easier. So there you have it, the 3 things you need to consider about self storage: cost, location and type of unit. And also the 3 most common reasons for using self storage; small business storage, house movers and house renovators.